Bandol rosé: Salmon pink, golden, orange and mango tones. An almost unbearable loveliness. In Yasmina Reza’s award-winning play, Art, Serge buys a minimalist painting – completely white – for an exorbitant sum. A debate ensues with his two friends about what is art, revealing the subjectivity of taste and how aesthetics is entangled with monetary value. Serge could be delineating a bottle of French rosé: “It may be said that it is very pale.” A discussion ensues on the stage about being moved (ému) by the perceived colours. In today’s booming market for French rosé, minimalism is the rage. Minimalism is paleness, even paler than pink. These Provençal rosés, or brands, are produced on a massive scale by négociants who purchase grapes or juice from unidentified growers of unknown terroirs. Gentle high tech presses that avoid grinding the grapes, and heat-exchange coils for cool fermentation effect a pale, dry style. This simply comes down to a method of wine making encapsulated into a brand. The brand requires a concomitant place to make it serviceable to the consumer. “Provence” has efficacy as an image of some quaint perpetual prelapsarian place. By bracketing reality into stereotyped pink-tinged notions, one dismisses all mention of a vineyard, a winemaker, a terroir, or grape varieties. Biodynamic nor organic wines these are not. The paler the rosé the better, some producers, like Sacha Lichine of the mega-brand Whispering Angel, say, conflating colour with quality. It is a way of managing not only one’s perceptions of rosé, but also to pre-articulate taste. The result: an endless supply of a commodity, uniform in the lack of colour. In her new book, Rosé: Understanding the Pink Wine Revolution, Elizabeth Gabay takes on this contentious issue posed by many rosé producers who put brand mystique – a pale, dry style created by the winemaker – over a sense of terroir and place. “With the dominance of an international pale pink style, we are close to losing the originality, creativity and regionality of rosé. Under constant threat from sublime minimalism, one French appellation produces rosés with an affecting richness and structure whose ravishing bouquet transports you into the higher reaches of viticultural art: Bandol. An appellation can embody the anthropology of wine culture. No more so than in AOC Bandol, which stretches inland from the Mediterranean seaport village of Bandol. Unique among French appellations, Bandol is the only one that cultivates predominately Mourvèdre to produce world class red and rosé wines. In the 1940’s, Bandol undertook the large-scale replanting of Mourvèdre, whereas other Provence appellations replanted other higher-yielding varietals. Bandol, one of the four original appellations of Provence wines, covers 3,700 acres where 59 independent wineries account for 60% of the production, with the 40% produced by four wine cooperatives. For limiting soil erosion and retaining moisture, winemakers employ low dry-stone walls to form terraces, called “restanques.” Under the full suppressing heat of summer, the terraced vineyards of Bandol are caressed at the onset of evening by cool sea breezes. Bandol rosés, which represent about 65% of the appellation’s production, have a brilliant reputation. It is earned from a way of blending grape varieties that is theirs alone, irreproachable in itself due to the structure and the balance of Mourvèdre, which dominates the blend. The leading estates in Bandol have 50%, or more, of Mourvèdre in their rosé blends, with equal amounts of Grenache and Cinsault. Some producers turn out another style of Bandol rosés of roughly equal parts of the three grape varieties. Bandol mandates a minimum amount of 20% Mourvèdre for rosés (50% for its reds). The typical vinification of Bandol rosés is 50% saignée (bleeding) and 50% direct press. 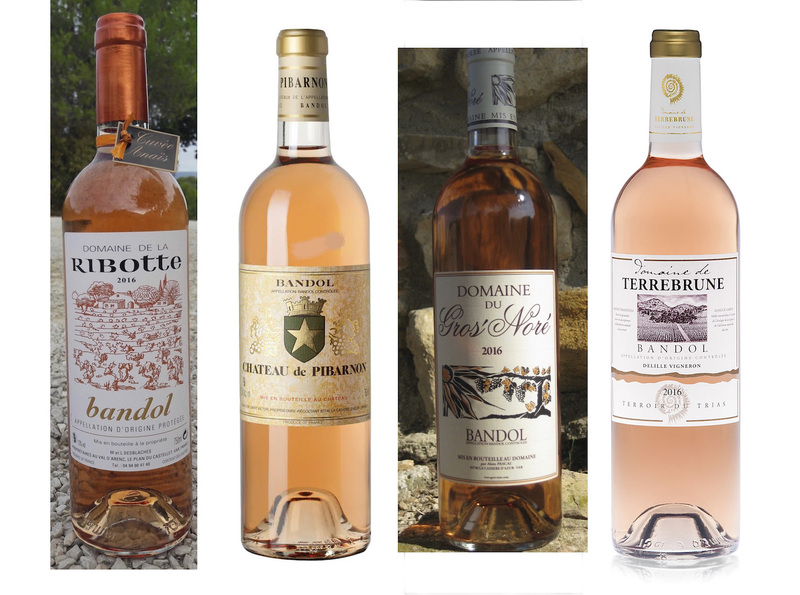 The savory structure of Bandol rosés have earned a place at the dinner table as gastronomic rosés, or a rosé d’assiette. Likewise, Bandol rosés are heralded as cellar-worthy for a few years, or longer with splendid vintages. 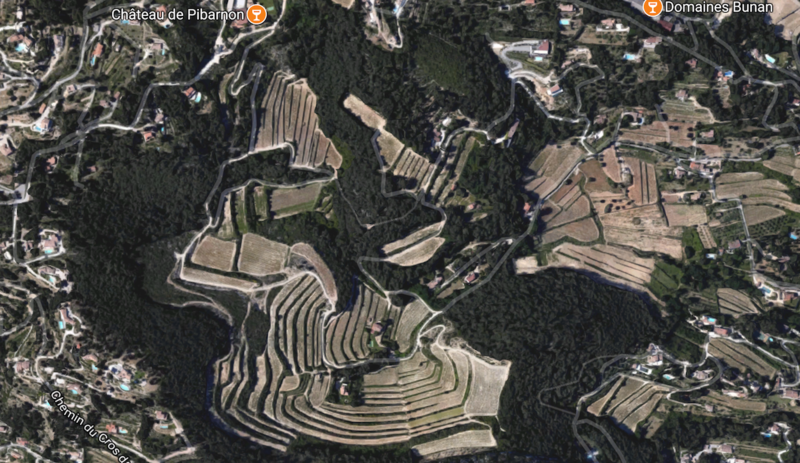 Bandol: “Restanques” – low dry-stone walls to form terraces – limit soil erosion and retain moisture. Mourvèdre gives Bandol rosé more tannin and structure than other Provence rosés. The color palette of Bandol rosé is nothing but sumptuous with a range of tints: pink salmon, peach, pale orange mango, rustic gold and a pale pomegranate. Mourvèdre is a gamey, richly-coloured grape. It is thick-skinned. Because it is very late ripening, Mourvèdre demands a hot arid climate. The nose of Mourvèdre-based rosés offers up glorious aromas beyond high-toned fruit: gardenia, white blossoms, fennel, anise and spicy aromas. In The Sustainable Wine Blog, Eric de Saint-Victor from Château de Pibarnon, who practices organic farming, refers to Mourvèdre as the “tall man who can dance”. Unpacking that description, “tall” denotes a vertical taste structure, a rich texture. “Dance” references an aerien quality – light and vibrant – with an razor-like acidity. Never part of any fashion or fad, Bandol does not play games, try to seduce you, or attempt to be modern. You take Bandol rosé for the tradition it embodies like I do, or if not, you can dismiss it as a matter of taste, or of couleur, or so you say. Unabashedly, Bandol rosé is a rosé like nothing else. Domaine de la Ribotte: 55% Mourvèdre rosé.. Info here. Chateau de Pibarnon: 65% Mourvèdre rosé. Info here. Domaine Tempier: 55% Mourvèdre rosé. Info here. Domaine de Terrebrune: 50% Mourvèdre rosé. Info here. Domaine du Gros Noré: 50% Mourvèdre rosé. Info Here.